Check out national current events of November 2013 here. 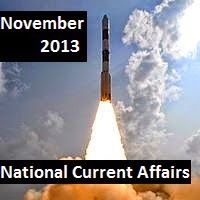 Current affairs for SSB interview, AFCAT, NDA and all other exams are provided for the month of November 2013. Let us see national current affairs in the month of November 2013 day wise so that you may be ahead in SSB interview and other exams. Indian Shashi Kant Sharma, the Comptroller and Audit - General wins the crucial election to thhe UN Board of Auditors. As FII inflows increased, SENSEX touches all time high of 21,294 points. Ministry of Health announces that the dengue outbreak in 2013 was the worst outbreak in last six years. Britain drops its idea to impose a 3000 pound immigration bond on visitors from high-risk countris in Africa, and Asia. India has strongly protested against the project. RADAR stations were stationed by China near Ladakh region to keep an eye on Indian planes over the area. Mangalyan - India's maiden Mars orbiter launched fom Satish Dhawan Space Centre in Shriharikota. Indian and China start a ten-day joint military operation drill in Chengdu in South-Western China to improve anti-terrorist capability. The Royal Highnesses - Prince Charles and his wife Ms. Camilla, Dutches of Cornwell reached India on 9 days visit. World Billionaire Census 2013 published that Indians amount to 6th largest numbers of millionaires in the world. In a major verdict by the Guahati High Court nullifies the Union Home Ministry's resolution of constituting Centeal Bureau of Investigation (CBI) in 1963. By this judgement into effect, CBI can no longer lodge any FIR or act on any legal cases. Thus, the major scams unfolded in the year 2013 such as 2G spectrum scam, coalgate scam etc., will be considered as null and void as CBI is not legal body to probe. Prime Minister Dr. Manmohan Singh decides to skip the Commonwealth Heads of Government Meeting (CHOGM) in Colombo amidst the strong protests by section of Indian population who were tortured during the civil war in Sri Lanka. Nineteenth Kolkata International Film Festival begins. Crisil report states Punjab on top as per Prosperity Index, Kerala on top of Equality index, Maharashtra top of Per Capita Income index. Whereas, Madhya Pradesh is on the bottom of Prosperity Index, Andhra Pradesh on the bottom of Equality index and Bihar is on the bottom of Per Capita Income index. 70% turnout recorded in Chattisgarh. India placed at 32nd in the financial secrecy index world-wide. Switzerland tops the list.